Here's 5 Tips For Tackling BIG Projects! Feeling Intimidated By A Painting? Trick yourself into playing the game. Like most games, the outcome doesn't really matter. Really. Let's be honest. Marbling - Faux or Foe? Learn how to become friends with some marbling techniques you may not have used before. And a tutorial or two! Check out our new page. Register now for "Sea, Sun & Shadows - Deconstructed", our first truly global, interactive tutorial event. JenniferTelford. A talented Melbourne artist/designer and highly amusing lady with an upcoming exhibition. If you like large & colourful painted ladies (and let's be honest, who doesn't! ), this one's for you! Check out Jen's exhibition info here.. Some great ideas in this article written by Eric Maisel on how to overcome the intimidation of a project you think may be "too hard". Your approach to "hard" projects transcends making art and can also be applied to any area of your life. Wow, that's deep. But true. And awesome! Change your mindset from the can't to the can.. 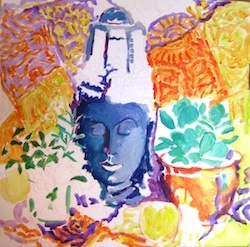 This month's post comes from Christine Read, friend of Lennox Artspace, student of Mark's and all round lovely person. (Chris also featured in AA008 WIP section). 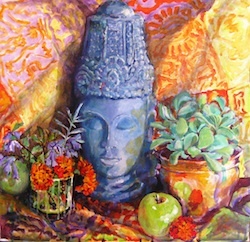 "Lately I have been increasingly interested in creating still life images. There is something compelling about creating the design and the intricacies of placement, colour, and the fact that each of the objects has a place in my home. Last year I went to the Margaret Olley exhibition at the Tweed Gallery and was absolutely struck by how her wonderfully creative spirit seemed to lodge in her surroundings - at least in her later years. So many images repeated over time and in different light and placements, but never boring. The subject matter of my work, Carved Head with Apples has as a central point an ancient carved Cambodian head which sits in my garden and which I bought many years ago from a friend of my parents. The friend's name was Lorna and I have always called the head 'Princess Lorna', so there is some sentimentality in capturing her. I roughly drew in the outline of the various elements and then tried to quickly paint in the main colours of the throw. 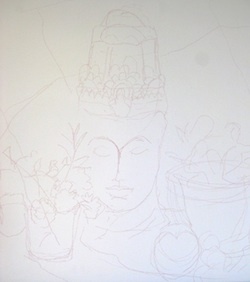 I then roughed in other elements such as the brass bowl and plant material. I tried to get an idea of the placement of the negative spaces to give some form. Then, a bit more colour and form - it is really fun standing back and starting to feel the image come to life. I get back from the painting often and just observe. I always like to have music playing - often classical but also Dire Straits, Santana, Annie Lennox or Queen. It all helps to get me into the 'zone'. Some of the edges are now starting to appear and it's really important at this stage to know where my lights are - they help to give that three dimensional impression. I love to play with reflective surfaces, they provide a lot of life to the image. Lots more colour is added, and a deepening of the shadows - looking closely to see where the reflections are. It's at this stage that I start to get the shapes closer to 'real'. I was excited about moving onto the intense detailed carving in the headdress - but it was important to live with it for a while and get to really 'see' it before I started to paint it because I wanted to get it right first time. 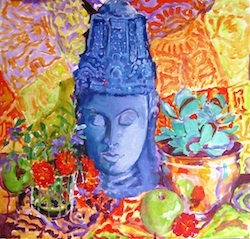 The headdress is coloured and the apple in the foreground has it's highlights. I needed to look more at the background and how I wanted it to look - I didn't want it to overshadow the foreground or to be too flat. There are now some folds in the cloth of the background and I have really tried to put in more contrast between the head and the brass bowl. The cactus is starting to take shape, as well as the simple flowers in the glass vase. I like to try to play off contrasting colours to give some 'pop' - I love colour. At the end it's a matter of tidying up, there are some shadows on the head's face from the cactus; some of the detail is more clearly defined and I have rubbed back with water some of the very dark shadows in the cloth to give a softer feel. At some point you have to decide to stop and I like a 'loose-ish' feel in my work, so don't want to do much more - I'll sit with it now for a few weeks and then decide if it's finished." Christine is exhibiting at the Lennox Artspace from the 11th-24th April if you're keen for some more vibrant loose artwork for your eyeballs! Thanks so much Christine for sharing your colourful work with us again!